Santa Barbara's dormant water desalination plant. 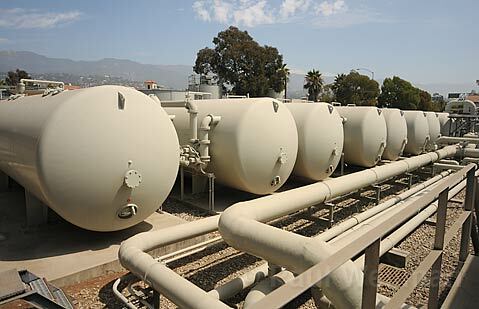 Next month, the Santa Barbara City Council will take a critical action to rehabilitate our mothballed desalination plant. I support the project, despite my misgivings about its environmental impacts. As one mitigation to the plant’s enormous energy demand, I will also support funding a study of Community Choice Energy, one of our best options for greening up the region’s energy portfolio. We’re experiencing the hottest, driest four-year period in recorded history, and Santa Barbara’s customary water sources are petering out. With a 25 percent cut in use, we will have enough water to make it through 2016. But without major rainfall in the winter of 2016-17, we’ll have less than half our normal supply. Cutting our use in half in less than two years would be very tough, indeed. The Santa Barbara landscape would suffer irreparable damage. Last winter, we started looking in earnest at firing up our mothballed desalination plant. The desal plant was built in a panic 25 years ago when the unthinkable occurred — Gibraltar went dry, and Cachuma nearly did so. Now, lake levels are once again low and dropping fast. The state water system, in which we invested hundreds of millions of dollars, will deliver only a tiny fraction of our allocation. For the contingency of a fifth year of drought, the city’s Long-Term Water Supply Plan calls for the desal plant to go back online. The desal plant will provide a quarter of our normal supply. If more drought years come, the plant can be scaled up to provide two-thirds of our normal use. Regardless, conservation will continue to play a strong role in controlling water use. I say “continue” because Santa Barbara is a leader in water conservation. Over the last 25 years, a range of programs, such as toilet, appliance, and landscape rebates, plumbing audits, and rain-sensing irrigation systems, have resulted in a major reduction in use. Even in normal years (remember those?) and including significant urban growth, Santa Barbara’s water use is 20 percent less than in the mid-1980s. Water rates have been key to Santa Barbara’s conservation effort. In the drought of 1987-91, Santa Barbara introduced the “Big Bang” of conservation rates. The emergency tiered rate structure penalized high water consumption so stiffly that water use was cut in half in a matter of months. Since then, Santa Barbara has continued to use moderate tiered rates to encourage conservation. But we’re prevented from going back to the system that was so successful in the last drought. Turns out those disciplinary rates violate Proposition 218, a recent constitutional amendment, which ties rates to the cost of water rather than to its use. In times of shortage, we need the flexibility to use rates to control excessive water use. I hope that state legislators move quickly to put conservation rates on the ballot. It is the fairest and most efficient method we have to manage our water use. This drought is seeing a dramatic growth in water purchases, wherein cities purchase water for short-term use from farmers and agencies with surplus supplies. Santa Barbara has purchased water from Vandenberg Air Force Base and Sacramento Valley rice farmers, among others. The pipe that was built to bring state water moves purchased water through the state’s network of canals and into our local system. Together with rates, water purchases have the most potential for cities to maintain adequate supplies while keeping farmers whole. Planning at state and federal levels will need to deal with more water worries linked to Cachuma Reservoir and other systems statewide. With Cachuma, local stakeholders are cringing in wait for the “biological opinion” soon to be handed down by the National Marine Fisheries Service. Our worry is that more Cachuma water — much more — could be allocated to the steelhead trout. We’ll have to compensate for that reduction with conservation and other supplies. Farms are responsible for 80 percent of California’s water use and are largely responsible for overdrafting virtually all the state’s groundwater basins. And the water doesn’t just go to high-value orchards and vineyards. For example, California grows over a million acres of hay, a low-value crop that uses nearly as much water as all our cities combined. I would support paying alfalfa farms handsomely for a bit of their water, particularly if it meant we could avoid investing tens of millions of dollars in a desal plant. Water planning takes lots of time, negotiation, and money. I hope this drought helps focus everyone’s attention on making California’s water system fairer, greener, and more sustainable. We’ve got a very long way to go. Meanwhile, in the face of this terrible drought, Santa Barbara’s best option is to move forward with the desal plant. It will be expensive, but it will be dependable.